To me, the most important factor when shopping is buying regional produce. We are very fortunate in South Africa that our local Woolworths lets us know where the produce comes from. To that end I always buy fruit and vegetables that are labelled as being from South Africa. Of course, if I had any influence I would ask them to be more area specific as I live in farming country and would like to support my local farmers. But, at least I know that the fresh produce I buy is seasonal and that is the second most important factor to me. It is only after this that I look our for organic produce. That is the bonus factor to me and not the be all and end all of my shopping. When it comes to protein I want to know that the animal led a happy life. I buy our chicken from a local, free range chicken farm, and our venison from the local butcher. The venison is shot by the owner and hung and butchered properly. These pork cheeks came from Martin who owns Cure Deli. The quality is amazing, the price is perfect and the pigs have been treated with love before ending up on my plate. Given the success we had with making a pork belly in master stock I decided to do the same with the pork cheeks. I am not sure how easy they are to get hold of where you live, but do ask your butcher as I am sure he would be willing to help. Do you eat regional and seasonal produce? Love pork cheeks and you’ve done them justice! They’ve become trendy in England (and therefore expensive) but still quite easy yo get hold of in Spain. What a delicious sounding dish. I’ve not seen pork cheeks in our market but your meal sounds great with your wonderful seasonings. I’ve actually never made pork cheeks before. We do buy almost all of our meat from local farmers and much of our produce as well. I love it and these look delicious! Hi Tandy, wow! very impressive. Yes we do eat mostly seasonal and regional especially when we are in Oregon. That’s so great that your local store tells you where all your produce is from. I try to buy local, but it’s not always easy in these New England winters! 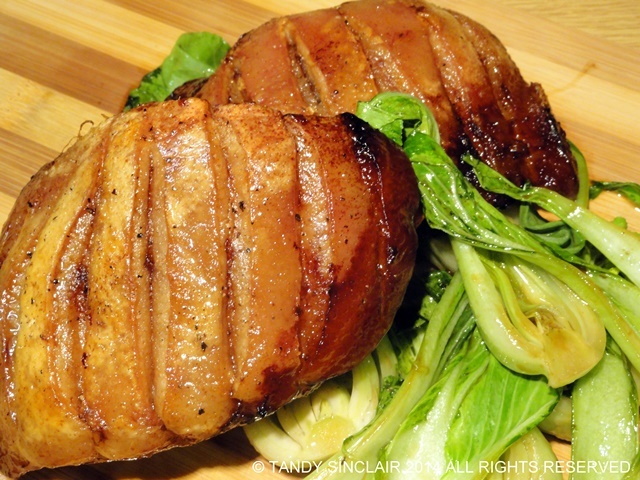 These pork cheeks look so delicious! Beautifully braised cheeks, what a wonderful meal! YAY! I’m so pleased that you used the Master Stock again Tandy! 😀 These pork cheeks look divine! Never cooked pork cheeks before Tandy. They look scrumptious. I’m passionate about buying and cooking locally and seasonally – it makes you so much more aware of what’s in season and what’s available in your area – so agree with you about organic, Tandy. OMG – those pork cheeks look fab – I have been wanting to cook them for ages but unfortunately have not been able to find them – yet!